The Church of Saint Clotilde ("Sainte Clotilde" spelled with an "e" in French designating feminine) quietly tucked away near Hotel Les Invalides, is one of the many fine surprises that comes to those who walk around this city. This church reflects the movement of the 19th century to emphasize architectural styles of the past. 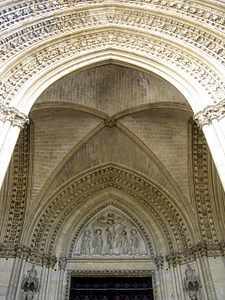 Its neo-gothic grandeur gives the impression that it has been here for centuries. 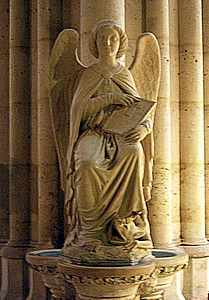 The Church is another of the great achievements of Claude-Philibert Barthelot, the Count of Rambuteau. He was the 8th Prefect of the Seine from 1833-1848 and was responsible for the completion of the Arc de Triomphe, Sainte Marie Madelene and Square Jean XIII behind the Cathedral of Notre Dame. He also introduced the beginnings of a modern water system, the first railway station in Paris, Gare Saint Lazare in 1837, and the construction of the first of the Grand Boulevards. The Count Rambuteau was predecessor to Baron Haussman who furthered his work of transforming Paris from a medieval town into a modern city. The Church was first conceived of in 1827. The parish church of Saint Thomas Aquinas and the small chapel of Saint Valere had simply become too small to handle the growth of the neighborhood. Construction began in 1846 under the direction of architect Francois Christian Gau of Cologne. After his death in 1853, the work was taken over by Theodore Ballu. When the building was completed, the Church was consecrated in November, 1857. 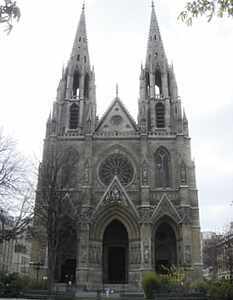 In 1897, Pope Leo XIII raised it to a minor basilica. 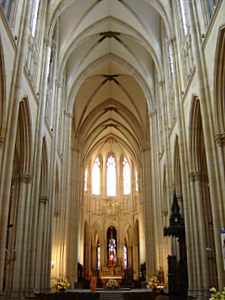 The Church is an imposing gothic structure of the 13th century style. It is built in the form of the Latin cross, selected by Gau to add to its lightness. The facade is decorated with traditional Gothic statues commemorating the early Christian pioneers of the City. 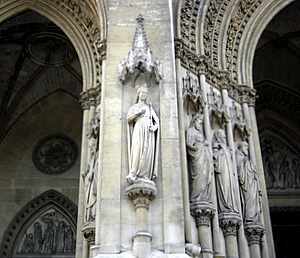 Sculptures of Clovis and Saint Clotilde adorn the main entrance and were the creations of Geoffroy Dechaume. The interior of the Church has many beautiful examples of stained glass, the works of d'Amaury-Duval, Hesse, Galimard and Jourdy. 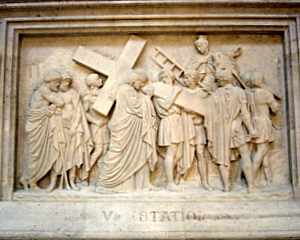 The sculptures and bas-reliefs of the Way of the Cross were completed in 1852 by James Pradier. The church has a magnificent organ constructed by Cavaille-Coll and was played for over thirty years by composer Cesar Frank. The Church of Saint Clotilde makes for an interesting stop along any walking tour of the area. Take a moment to find a park bench in the Square Samuel Rousseau in front of the Church and enjoy the quiet.